Lean manufacturing is a trusted and widespread methodology for eliminating waste in manufacturing. In fact, nearly 70% of manufacturers use Lean practices. However, if you’re like most manufacturers, Lean concepts get applied to productions, but not to sales and marketing. Why is this? It’s tough to apply Lean to customer interactions without good tools and a clear methodology. The good news is, things are getting much easier and eliminating waste in sales/marketing is within reach of any manufacturer. 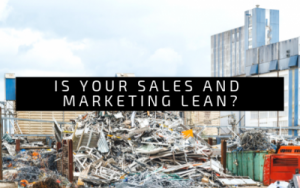 What are 8 Wastes of Lean Sales & Marketing? This could also be titled “under-utilized talent”. Sales and marketing folks should be able to focus nearly all of their time on serving customers, not running internal manual processes, digging for information, or creating proposals. Creating simple processes that keep sales and marketing folks in front of customers and out of administrative functions is key to eliminating waste – no one wants to be in sales or marketing to do non-selling activities. Digging through e-mail, remembering to make calls and follow up on tasks, editing word/excel documents, and creating lead follow up spreadsheets can be a thing of the past. Good CRM and marketing software like Flywheel can eliminate transportation overhead and keep you focused on deals. However, sales and marketing should hold the same standards – quote delivery should be kept to a minimum size queue with clear timelines to give customers quotes. Costs and margins should be transparent to salespeople so they can make good decisions at the time of need on pricing. Lastly it’s important that good “Control Tower” principles are applied to sales/marketing so folks get answers quickly. Modern software can help you get more done with fewer people. For things you can’t automate, eliminate as much duplication as you can using Value Stream Mapping. You can reduce cost and improve delivery by speeding up motion – often small adjustments in flow can have a big impact. Consider implementing a sales & marketing platform in your organization. Contact us to learn more or for recommendations. CEO/Business Executive Coaching: Use our business executive coaching to improve performance factors, such as profitability, and enhance company growth and value. Facilitated Management Meetings: Gain professional meeting facilitation in order to solve problems, resolve conflict or come to consensus effectively and efficiently. It's time to go "Beyond the Numbers".